Items left behind in the Thomas Mountain cabin. Photo by Phil Brown. 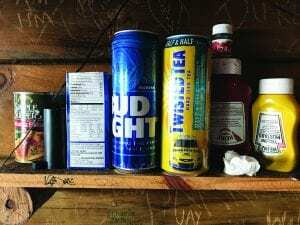 As I understand it, and I have seen firsthand, the Thomas Mountain cabin is coming down because some hikers use it as a trash bin leaving behind bottles, wrappers, trash of all sorts. Medical supplies have also been found (needles etc.). So while we want to blame DEC, in this case we need to blame rude and thoughtless hikers for ruining a good thing for the rest of us. A sad day indeed. Editor’s note: This comment is in response to a blog post on DEC’s plan to take down the cabin. The cabin is gone now.